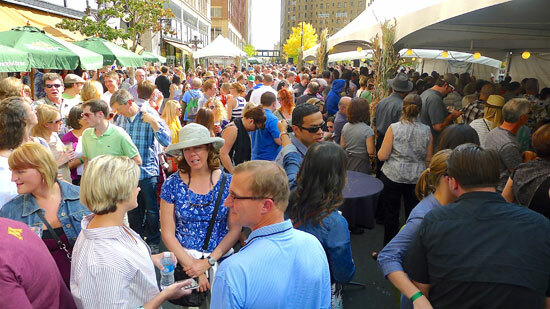 Yesterday, on a small section of St. Peter Street in St. Paul, a sold-out crowd celebrated Meritage’s 2nd annual Oysterfest. Chef-owner Russell Klein flew in 25,000 examples of some of the country’s finest and most sought-after oysters for the event. 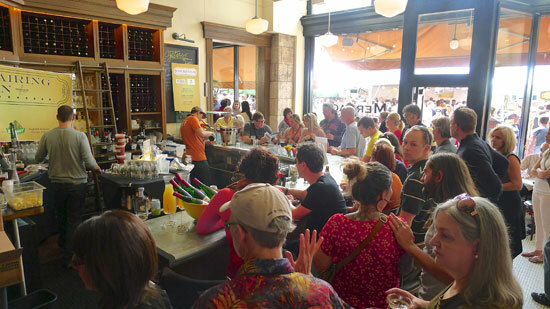 A perfect sunny day greeted the estimated 1,500 guests as they lined up to oyster-filled tubs of ice, while teams of shuckers did their best to keep up with demand. During the slurping frenzy, six chefs from Butcher & the Boar, Salty Tart, Vincent, Heartland, Haute Dish, and Meritage competed in an oyster shucking competition with Butcher’s incomparable Jack Riebel taking the win. Amongst the visiting oystermen in attendance, CJ “the oyster dude” Husk from Island Creek Oysters in Duxbury Mass., a former Boston bike messenger with a baseball cap and long beard, gave a short oyster-opening demo before the event. He explained that, “it’s more about getting the knife into the hinge than twisting. Then, once you’re in, pull the knife against the muscle, cutting it clean without gouging the oyster.” Most restaurant workers I know open oysters by pushing them onto a cutting board with a towel as protection. Then with a substantial amount of effort, they pry the oyster open. Not my man CJ “the oyster dude.” He cradled the oyster in one hand, no board or towel necessary, and easily slipped the knife into the hinge. The trick, he said, was to place the tip of your pointer finger near the tip of the knife. 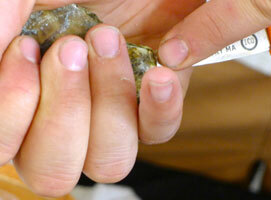 The fingertip acts as a brake, and the knife only pushes into the oyster a small distance—maybe an 1/8 inch. Less effort is needed and “not much of the knife needs to get inside anyway.” Having a sharp pointed oyster knife helps, and Island Creek sells a good example on their website for $20. Beyond technique, the oysters from Island Creek tasted fresh and briny, like a stolen kiss from the Atlantic (although my nine-year-old Sonia might have disagreed). They’re so good that Thomas Keller uses them on his famed “oysters and pearls” dish, in which oysters nestle in tapioca and spoonfuls of caviar. “We hand pick Kellor’s oysters. He likes them round with a deep cup for more juice. We put them in a pile called the PS pile—ya know, for Per Se, his New York restaurant. “Here, this would be a good one for the PS pile,” he said, and grabbed a round, perfect-looking oyster from the tub. Island Creek sells their oysters retail with next-day delivery at $1.50 each for a 100-count bag. For less than the gratuity at Per Se, you could get the crew together for a world-class oyster fest in your own backyard. Do me a favor though. Don’t tell them I told you about the PS pile.